SILICON SLOPES, Utah – June 28, 2016 – Domo today released “Data Never Sleeps 4.0.” This is the fourth annual iteration of the playfully informative study, which provides one-minute slices of consumer behavior from across the most popular destinations in the internet’s digital universe, including Snapchat, Instagram, Amazon, Twitter, Dropbox, Tinder, The Weather Channel and more. 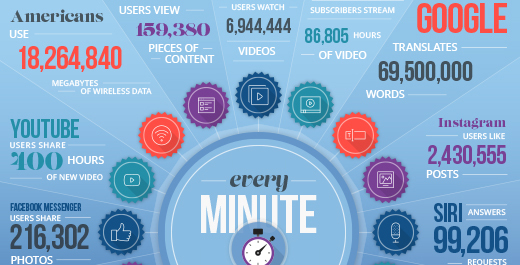 Domo introduced the “Data Never Sleeps” project in 2013 to provide a snapshot into the volume and velocity of data that is being created and shared online each minute. This year’s edition highlights the world’s current obsession with multimedia messaging, spotlighting data from newcomers to the report like Facebook Messenger, Siri and Giphy. Swiping and snapping increase. Tinder users are swiping 972,222 times per minute, increasing by 65 percent since last year, and Snapchat users view more than 6 million video snaps, increasing from just 284k snaps in total in last year’s study. An increasingly curious audience. The Weather Channel received 13,888,889 forecast requests online, and users are increasingly leveraging voice technology to interact with data, requesting answers from Siri 99,206 times per minute. Users flock to multimedia. Every minute users share 569,217 GIFs through Giphy, 216,302 photos through Facebook Messenger, 3,567,850 text messages and 9,678 emoji-laden tweets. See the full infographic here for additional information about “Data Never Sleeps 4.0”. Domo helps every employee — from the CEO to the front line worker — optimize business performance by connecting them to the right data and people they need to improve business results. The company is backed with more than $500 million from the world’s best investors and is led by a management team with tenure at the world’s most well-known technology companies.